So this year I duly signed up, payed my €10 and received my confirmation email. To give you a bit of background, running is a sport I enjoy and have done lots. When I lived in London I was a member of the London Front Runners club and ran 10k twice a week with maybe a race or two thrown in at the weekends. I ran the London Marathon and countless half marathons until I had a knee injury and operation and I focused more on cycling and swimming. Anyway since I have been here I have taken up running again, in a modest way but as you may have gathered reading other posts, the landscape here is far from flat. In fact I can’t immediately think of a flat piece of land longer than 50 meters anywhere except down at the coast along the beach. This morning we woke to great clouds and threatening skies. The forecast is for rain all week and for us UK expats it's a bit depressing and definitely not what we signed up for. However, we are in a period of drought in Andalucia and this rain is very much needed so we keep our grumbles to ourselves. As we drove over to Melegis the rain started and I was reminded of that familiar pre cross country race feeling I had back in the UK. Registration was efficient and as I looked around I saw many fit looking men and women in running club vests and realised that these guys were going to be taking this seriously. I crossed my arms in front of my race number pinned to my top which was number 2 (over 500 had registered) This was just because I registered early not because I was the second best runner! Unusually the race began on time and off we jogged. Well I was jogging but it seemed everyone else was running. Down, down, down, along and up, up, UP, UP, UP. Dear god I thought I was going to die. At one point everyone was walking as far as I could see and I had to concede for a few meters. The hills were relentless and it was not a route I had practiced. Rubble tracks in the campo are a death trap if you walk them, covered with olives and fallen oranges, but running on them you have to treat it like an assault course. As luck would have it I managed to stay upright and after 46 minutes and 8.2k I finally reached Saleres, which of course is on a very steep hill which basically finished me off. I only just managed to hear Ian shout VENGA! Coughing and spluttering I launched myself over the finish line and into an enormous crate of oranges. Yes, about 10 feet from the finish line was a large wooden crate containing about 200kgs of oranges! Finishers got handed a sport rucksack containing a t shirt and space to fill with oranges. Suddenly the race didn't seem so painful. Ian was there to save me from collapsing and helped me back to the house with my bag full of oranges. The event does not end there though. As it is ‘Dia de Andalucia’ there is of course a fiesta! A HUGE paella is made and then its prize giving time. There is also a Cruzcampo (beer) stall offering free beer, not water, beer. Amazing! The winner is weighed on stage! Below is the press report on the race. 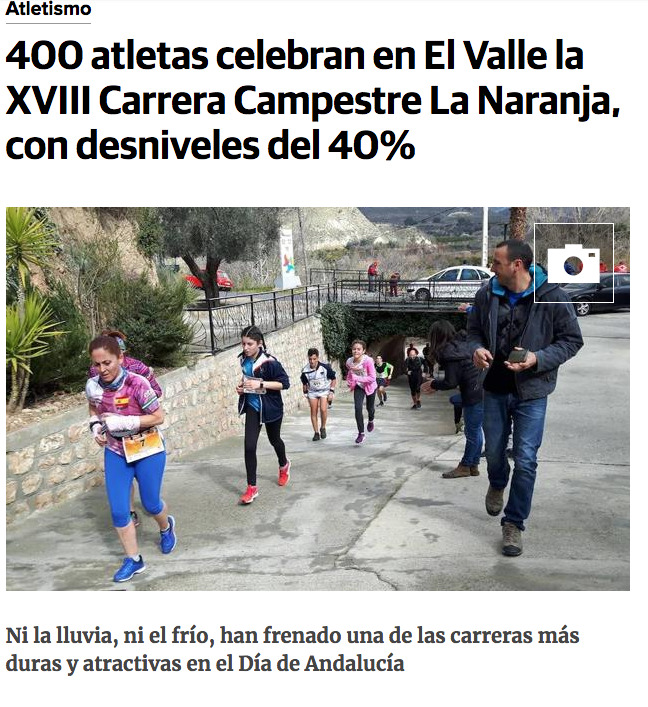 If your Spanish isn't up to it, basically says that it's a bloody difficult race with very steep hills!